When I saw a package of Tonga Treats Balinese batiks last year, I instantly thought of Inger. The colors and the life in them reminded me so much of her, I knew instantly I had to make a quilt for her out of those fabrics. So I bought them and got to work. 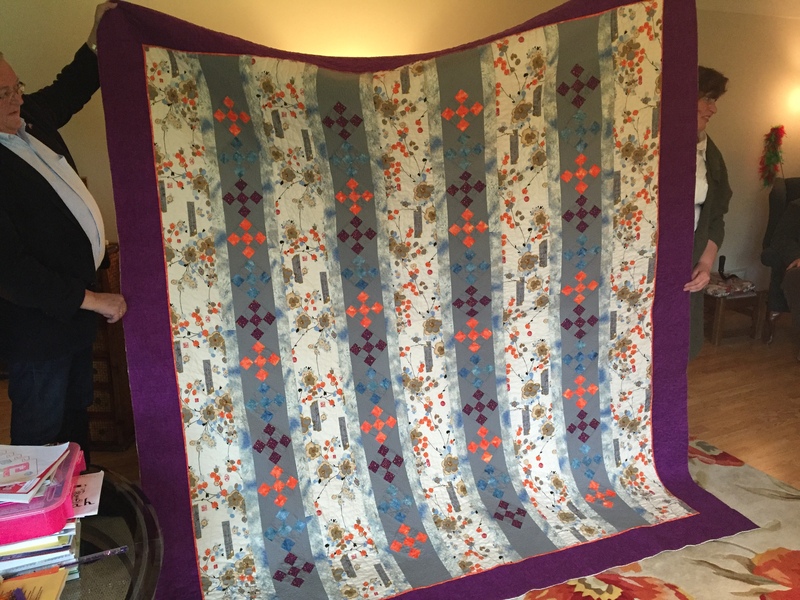 I completed the quilt in time to take it to her when we visited her near Beitostølen, Norway this summer. I had no idea how her house was decorated, and after arriving was afraid it wouldn’t match anything in her decor, so I told her to feel free to take to their home in Cypress or wherever she could use it, but I was delighted to learn her whole bedroom was done in soft shades of pink and the quilt looked very much at home after being put on the bed. It is a Terry Atkinson pattern, Merry Mosaic, and it was quilted by Mary Brandt. 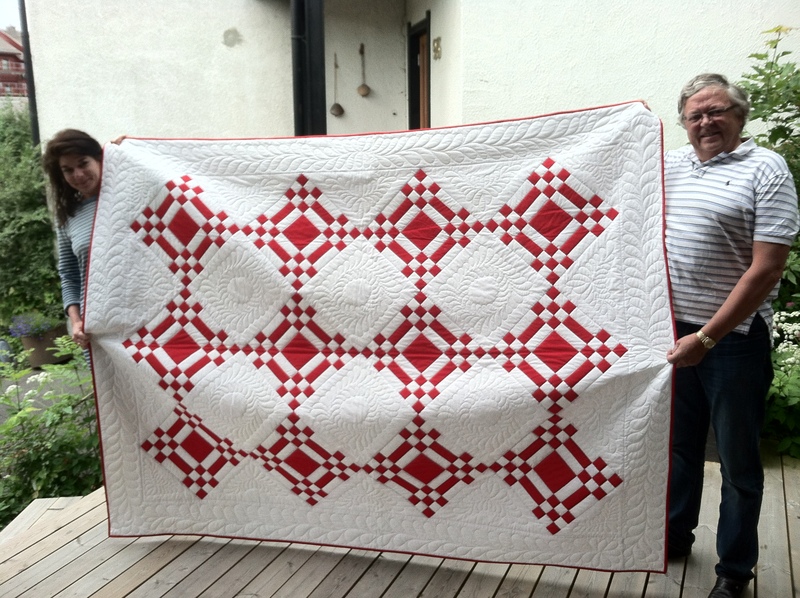 This is a quilt I made for Per & Regula and I took it with us to deliver to them when we arrived in Norway. 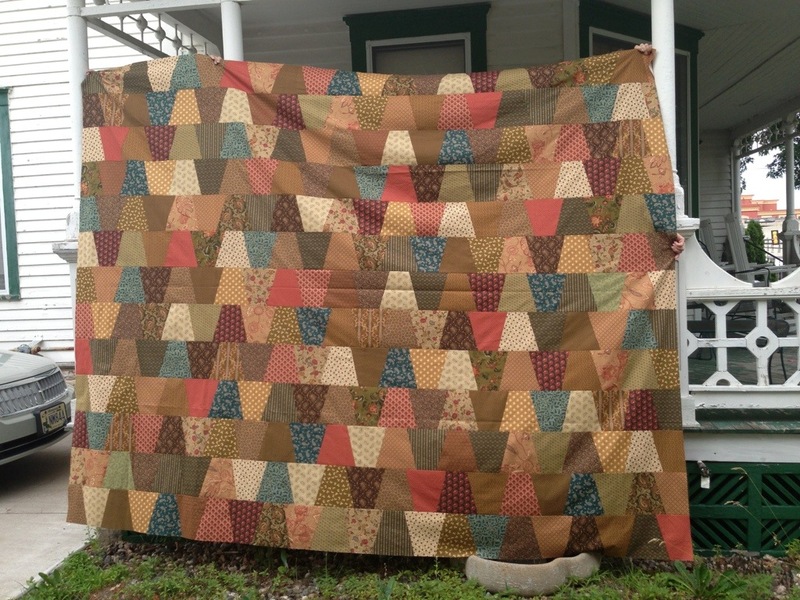 I’ve wanted to make a two color quilt for a long time, and this one came from a design I saw someone post on Pinterest. It was an easy block to figure out and to make. 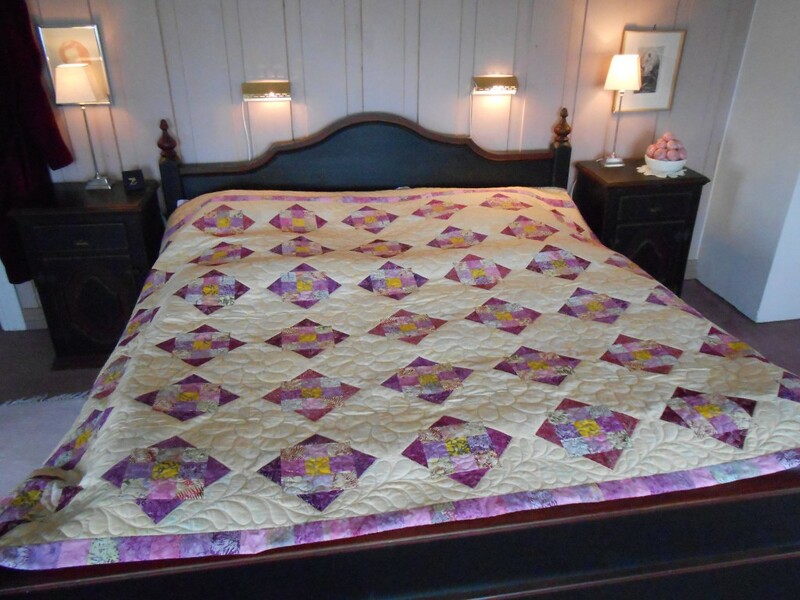 And it looks gorgeous with the quilting done by Mary Brandt. I am so pleased with how it turned out and I think Per & Regula liked it very much too! I took my beloved 1630 (I am the original owner) to a local dealer in February, 2013 for repair (yes, you read that right) and just got her back today. I can’t even begin to tell you how anxious being without this machine for a whole year has made me. Despite the fact that I have wonderful other machines, both newer and older, some of which have far more features than she does, I have missed this machine so much I almost cried when I went to pick her up and saw her plugged in a sewing like a dream. They fixed everything that was wrong with her and put her back into “as new” condition. I’m thrilled to say the least and will plan to use her as much as I can – after all, I don’t know how many more years she is going to last. I am seriously considering buying a spare as a backup. I know several other 1630 owners who have done this. It all started last February when I went to make a dress for my, then 3 year old, daughter and the decorative stitches and zig zag would not work, and I could not move the needle position for topstitching. I had no idea it would turn into a year-long ordeal. 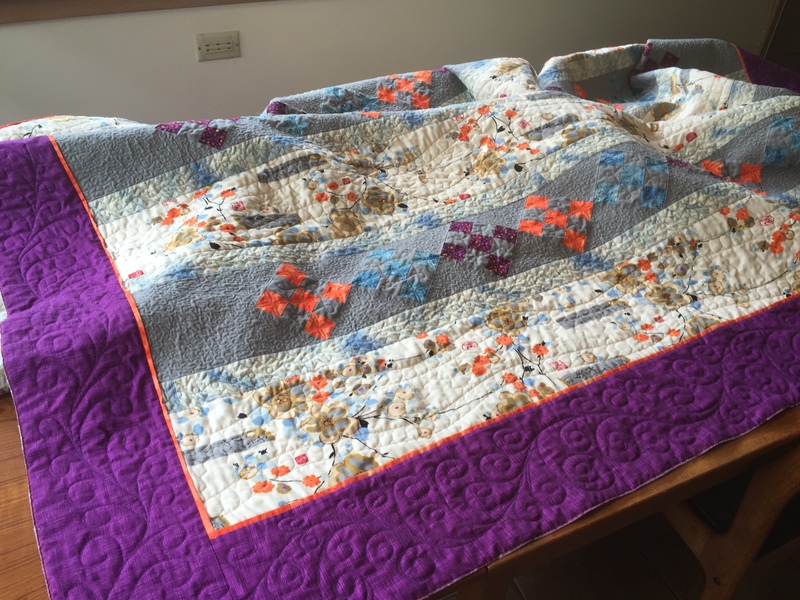 Without getting into the weeds, it was a lot of misses – misunderstandings, miscommunications, missteps, and she didn’t actually get sent off to Bernina corporate for repairs until December of this past year. The tech’s mother was dying the process, the Bernina dealer closed quite unexpectedly – it was just such a long, drawn out saga with too much drama. 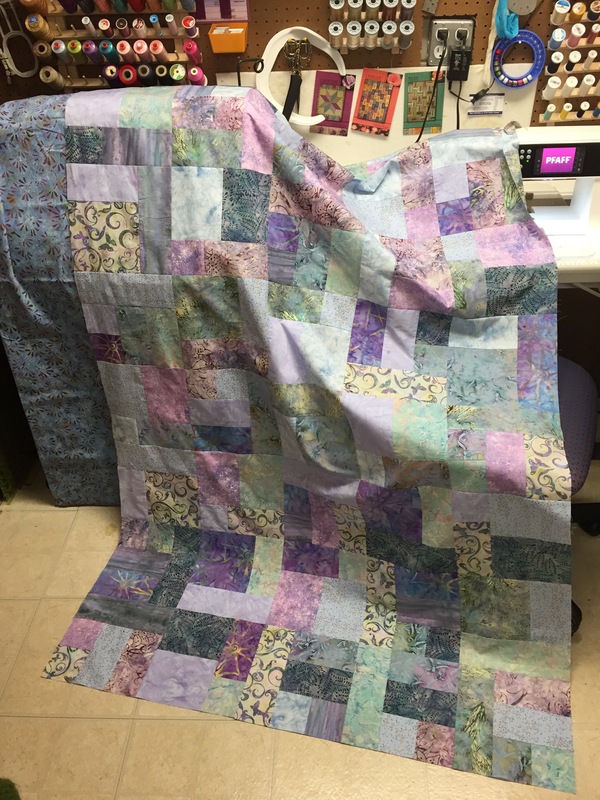 I have so many quilts to finish and an evening gown for a cousin to make before June, and I was hoping I could have my quiet-as-a-church-mouse 1630 back so I can sew the next couple of weeks while watching the Olympics. To say I am over the moon with happiness would not be an exaggeration in the slightest. And my husband? I am just not sure he gets it – I have a sentimental attachment to this Bernina, the one I waited for 13 years after graduating tailoring school before I could afford to but it – I will never have the bond with any other sewing machine that I have with this one. But we have a trip to Norway coming in June and I’ve got plenty of hostess and family gifts to get ready to take along – I’m thinking napkin sets, hankies, lots of lovely things that can be extremely well-made and packed flat. 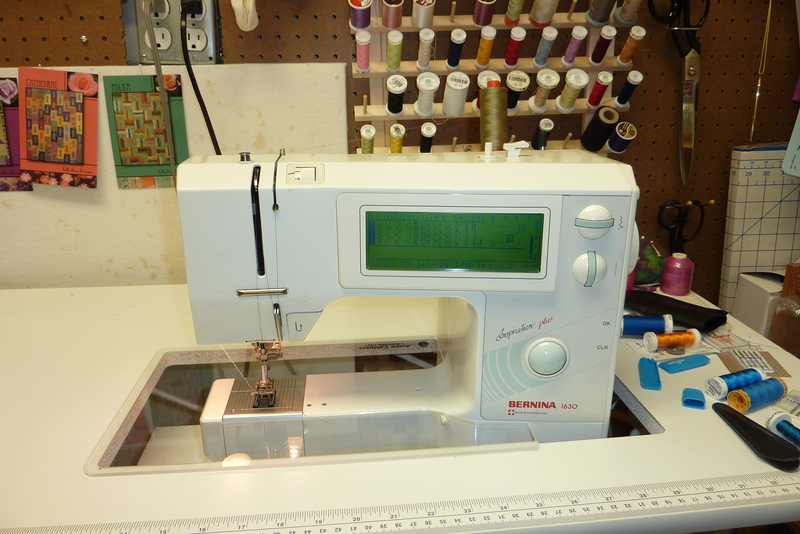 I just got to sew a few seems and she is so very quiet and smooth – nothing has ever sewn as well as this machine, at least not for me. I am so very, very happy that she is home again. Here is a picture of her in all her glory, sitting in her custom table cut-out, ready to get to work! Isn’t she lovely? 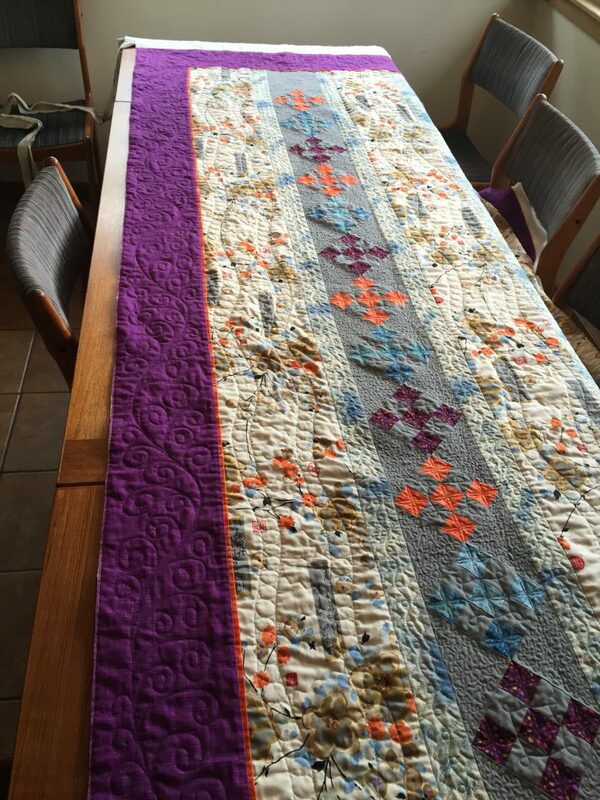 Got this table runner made last week too. And you know what? I LOVE making table runners, and they are good for practicing my machine quilting skills. 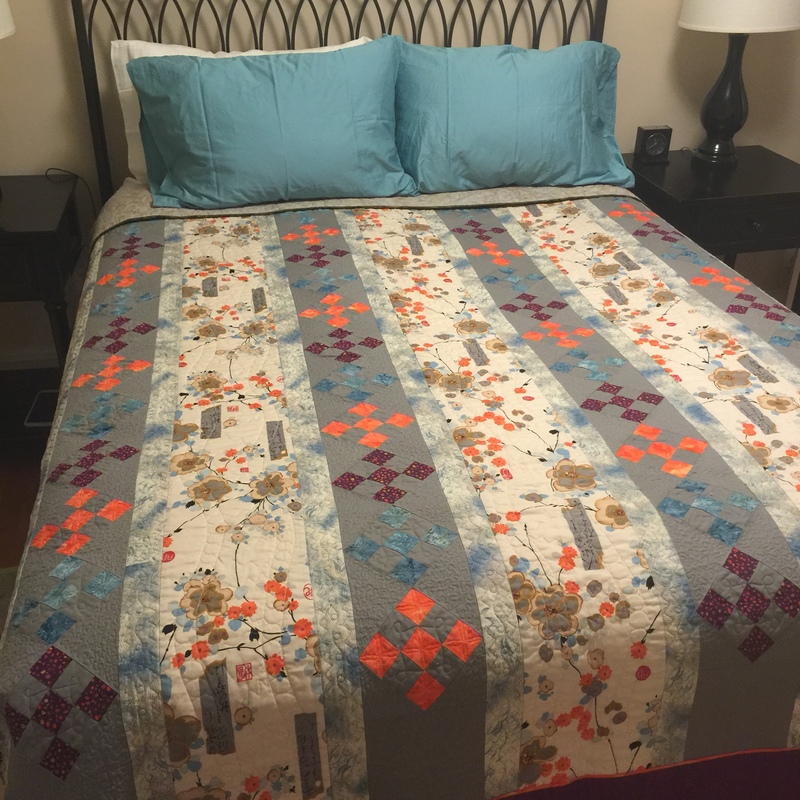 Here is a huge king size quilt for our bed – I just finished piecing the top at a quilt retreat last week. 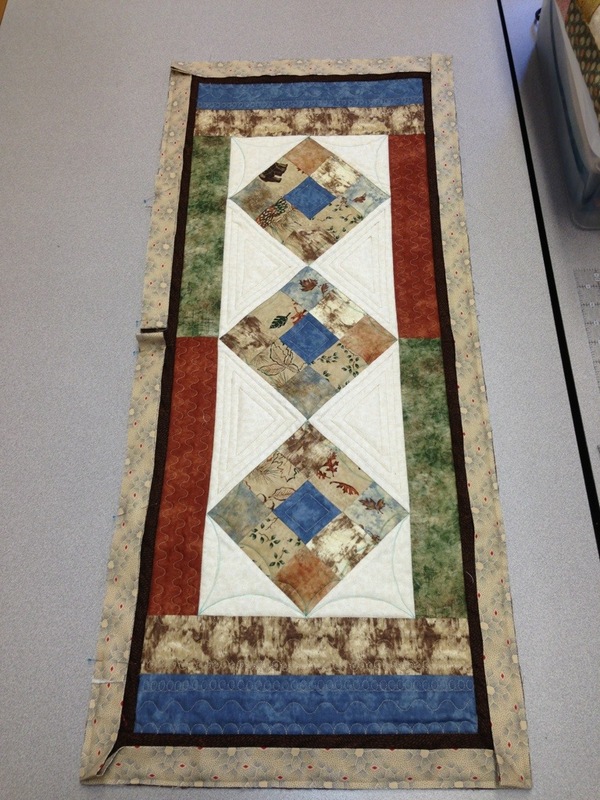 I’ve been at an in town day quilt retreat for the past two days. I can’t tell you how much I have needed this break from work and just to bury myself in what I love to do. Yesterday I spent all day finishing a special quilt. 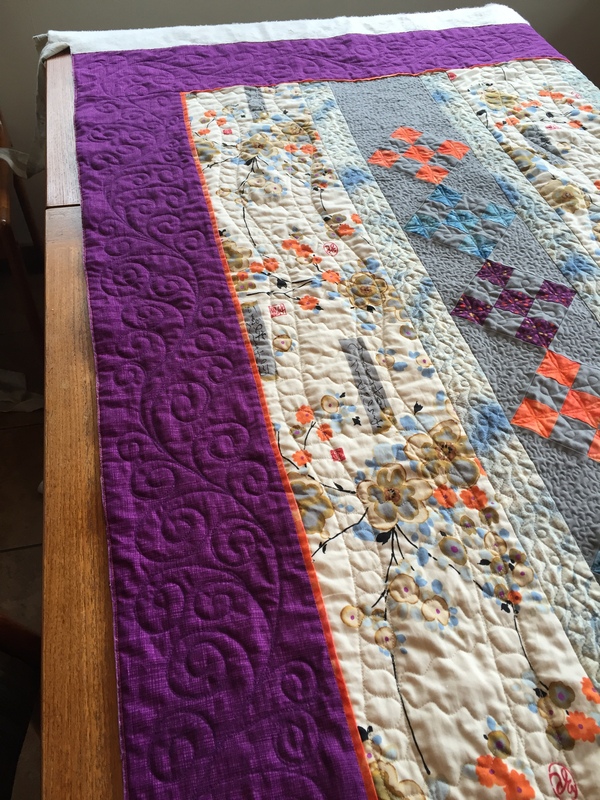 Today I finished up Juliette’s quilt top I started a year ago, and got the backings for four quits pieced and handed off to the quilter. Such a relief! And I’ve started a quilt kit that Harald picked out a while back when we stopped at Crystal’s Log Cabin Quilts in Grand Marais. I’ve made good progress on that one and it’s a simple pattern, so I may even finish it tomorrow. Oh, and did I mention that the retreat/workroom at Four Seasons, is FABULOUS?! Second floor, wrap around windows bring tons of light, lots of space, and a great quilt store downstairs for just about anything you need. I highly recommend it. And getting to come home to Harald, Juliette and my own bed every night is so good. Best of both worlds! 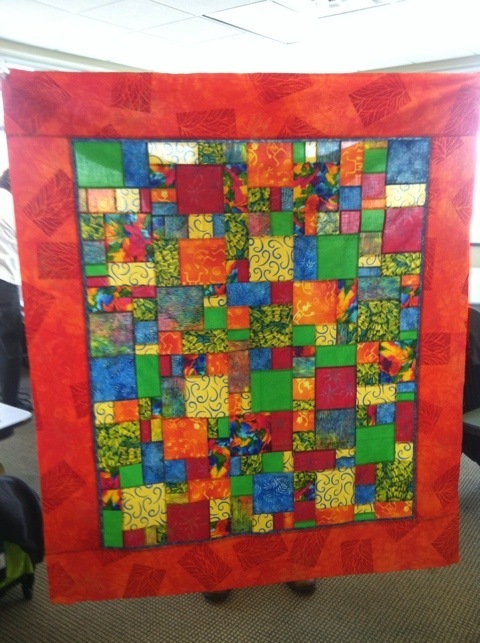 Below is Juliette’s quilt top I finished today.